Look at this picture of the gall bladder - make sure you can identify the mucosa, muscle layer (muscularis externa) and adventitia (or serosa). (Note, the gall bladder does not have a layer of mucularis mucosae or sub mucosa). The gall bladder is a simple muscular sac, lined by a simple columnar epithelium. It receives and stores bile from the liver via the hepatic and then cystic duct, and can store about 50 to 100ml in humans. It is attached to the visceral layer of the liver. The gall bladder is stimulated to contract and expel the bile into the duodenum, by the hormone cholecytoskinin pancreozymin (CCK) produced by the endocrine cells of the duodenal mucosa. The production of this enzyme is stimulated by the presence of fat in the proximal duodenum. The contractions expel bile into the common bile duct, and the bile is then carried to the duodenum. The inner surface of the gall bladder is covered by the mucosa. The sufrace is made up of a simple columnar epithelium. The epithelial cells have microvilli, and look like absorptive cells in the intestine. Underneath the epithelium is the lamina propria. The wall of the bladder does not have a muscularis mucosae and submucosa. The muscularis externa (muscle layer) contains bundles of smooth muscle cells, collagen and elastic fibres. Underneath this, on the outside of the gall bladder is a thick layer of connective tissue, which contains large blood vessels, nerves and a lymphatic network. 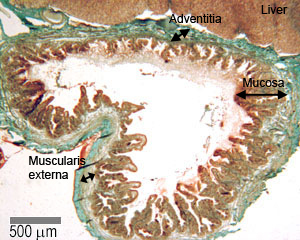 Where this layer is attached to the liver, it is called the adventia. In the unattached region, there is an outer layer of mesothelium and loose connective tissue (the serosa).